Designs by Lisa Somerville: Kitchen Sink Stamps - New Stamps...New Challenge...New Forums and a Guest! Kitchen Sink Stamps - New Stamps...New Challenge...New Forums and a Guest! Happy Kitchen Sink Stamps Monday! Kitchen Sink Stamps is starting the year off with a BANG! Not only did the new KSS Forums and Gallery open this past weekend (thanks to those who joined us), there's also new stamps , a new Crew Challenge and we have Barbara Washington joining us as a Guest Designer this month! 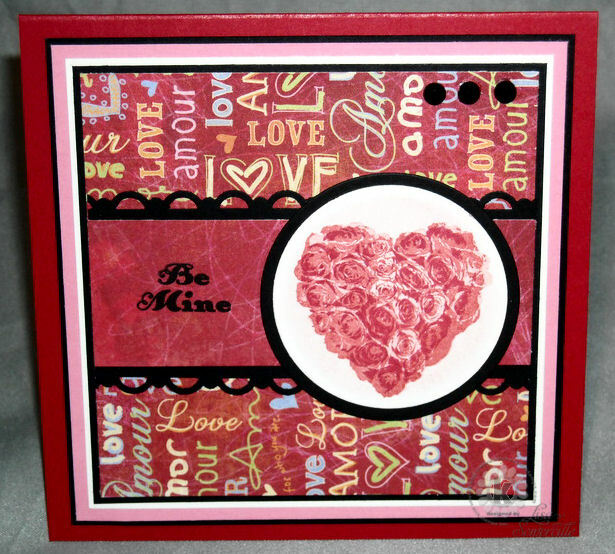 This Crew Challenge is to create a 10 Minute Card using Kitchen Sink Stamps. Easy, right? I think it takes me at least 10 minutes to coordinate my papers and card stock! But a challenge is a challenge, so I set out with my some of new KSS images and went to work trying to beat the clock! 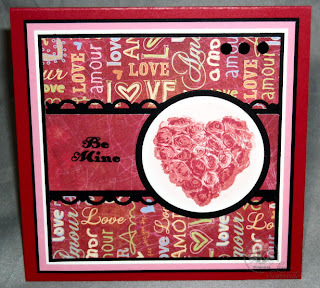 My first card uses the new Multi Step Sweet Heart Roses isn't that heart rose bouquet just beautiful! The Heart Roses are stamped on Vanilla card stock, I used the Wisped Frames Technique in Coral around the heart (it doesn't show in the photo, but is there IRL). The papers are from Basic Grey. I love the classic look of Black and White cards. 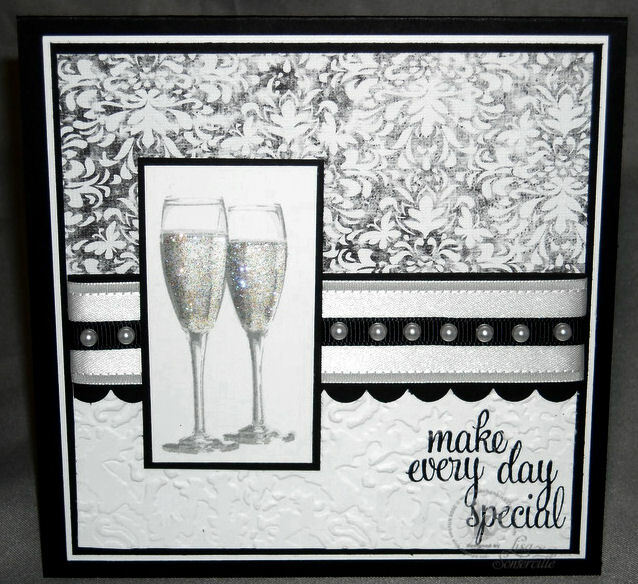 On the bottom White panel, I stamped the sentiment from this set in Black, then embossed the panel with the Damask folder. 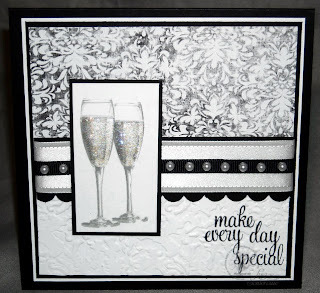 After stamping and assembling the rest of the card, I added some Stickles to the Champagne glasses for some sparkle. I have one other card to share - using the new Multi Step Bunch O' Balloons, but it didn't make the 10 minute challenge, and I haven't quite finished it, so I'll be posting it later this week! Both of my cards fit the Simon Says Stamp and Show Your Newest Stamp Challenge. Fabulous layouts and papers for these gorgeous 10 minute creations! Awesome work, Lisa! The rose heart is beautiful! Lovely Valentines card. Beautiful and elegant celebration card! Wow, both cards are beautiful, but the rose heart, wow! 10 min huh, you are just amazing! Beautiful rose heart! I also love the champagne glasses, very elegant! So rich and elegant Lisa...I love both cards but I have to say the rose heart is super amazing!! Great layout too! Hard to believe we are now thinking Valentine's Day! Love your rose heart and the black punched trim! Great touch using the stickles for the Champagne! Both cards are fabulous! These are both so wonderful, Lisa!! Love the papers you have used on both and the pearls with the ribbon on the second!! Can't wait to see your ballon card! I took advantage of the sale NYE so I am waiting for these wonderful sets to arrive. Thanks for sharing these fabulous ideas for them. Both these cards are lovely, but I adore the cool elegance of the black and white!! Fab! All I can say is WOW! These are spectacular cards. Thanks for the wonderful introduction. You go girl! You can work some serious magic in 10 minutes! WOW! Love the DPs you chose and the extra sparkles you gave the champagne. Very classy. Can't wait to see your balloons! Ooooo love those roses! The b/w card is a stunner! Lots of mojo in these beauties in such a short (10 min) amount of time! As always you rock those stamps ... I never seem to have the right shades of ink to make the layered stamps look right, but you always manage to pick just the right shades. Both cards are so pretty Lisa! What a fun technique - the heart looks gorgeous and love the elegance of the second! beautiful cards!! i love the heart on the first one, is so adorable!! thanks for playing with cardabilities! You made that gorgeous card in merely 10 minutes? And, it could be for any loving relationship...not just Valentine's Day, right? I love the stamp, love the layout! The champagne glasses look beautiful on black and white. So classic. Incredible job on both of these cards! Wonderful!